At the AMRA NSW exhibition at Liverpool on the October long weekend we purchased many items we will need for the layout, including lots of detailing items from Uneek/Antons Hobbies and Casula Hobbies. Amongst these items we purchased a water tank detailing kit from Peter Boormans Workshop to complement the water tank kit from Casula Hobbies. Railway drawings had previously been obtained for 'Standard Water Tanks', 'Standard Tank Stands' and 'Steel Details for Double Tier Tank Stand'. To supplement these drawings we had our own site photographs to refer to. The Casula water tank is a double tier 6 panel square type, which we cut down to a double tier 4 panel square type as per the prototype. The tank was quickly assembled and then work started on the steel trestle supports. One of three water tank trestle support subassemblies. For the trestles we used Evergreen styrene. There are a total of 9 trestle legs / columns in a 3 x 3 configuration. We constructed them as 3 separate subassemblies as per picture 1. H-section was used for the columns and the beams. The horizontal members are L-angle and the diagonals are round rod. Short lengths of 4mm C-channel were trimmed into unequal L-angles and used to make the gussets fixed to the H-columns that the horizontal angles and diagonal bracing rods are fixed to. 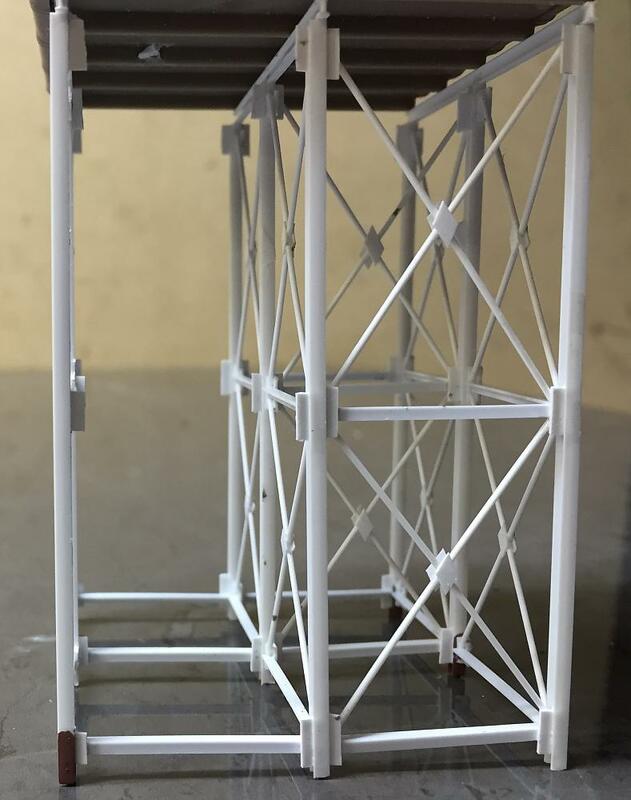 Where the diagonal bracing rods cross over each other a small rhomboid shaped piece of flat styrene was fixed to both sides to represent the clamp plates. The water tank and supports during construction. Each of the three subassemblies was attached to the underside of the water tank. Then we filled in all the remaining L-angles and cross bracing rods between each of the 3 subassemblies. It was fiddly work and required long tweezers, needle-nose pliers and a steady hand, but the end result is fantastic. Next steps are to paint the water tank and the trestle supports and to add the detailing kit. 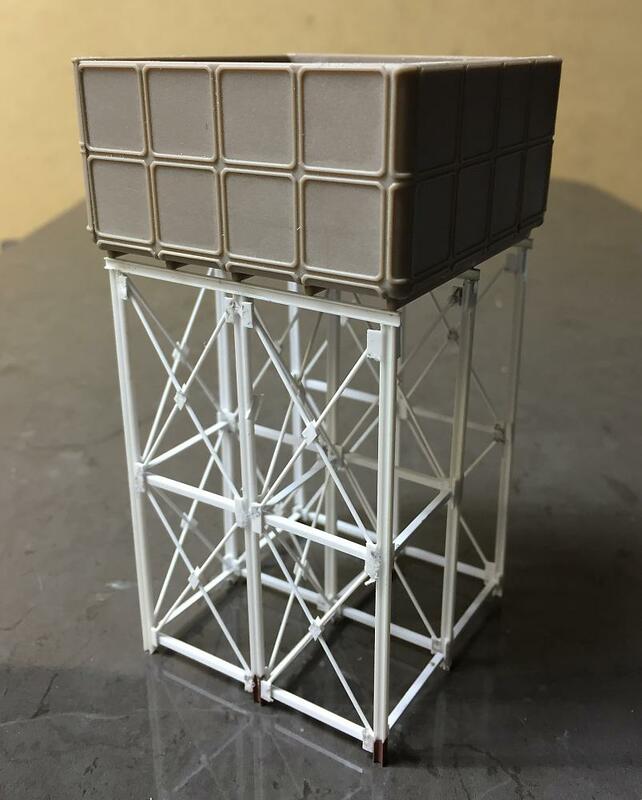 The water tank and supports almost completed and ready for painting and detailing. 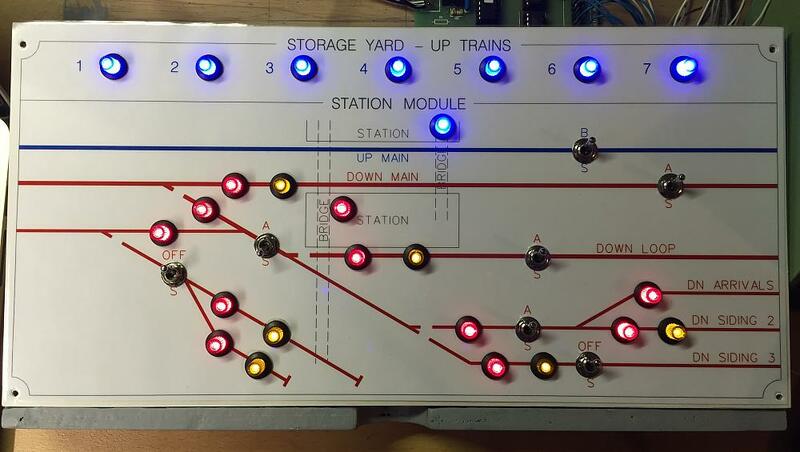 Work continues on the control of the layout, with the panel for the station module completed, tested and configured. The use of the CBUS system (as described in the June 2014 Construction Update) localises the wiring to the switches and LEDs on the panel, which will be hidden underneath the schematic in the drawer. Where possible, the train power cabling from the throttles to the track block toggle switches was also wired, in readiness for the drawer to be installed in the module. The station module control panel with all the LEDs lit during the testing phase. 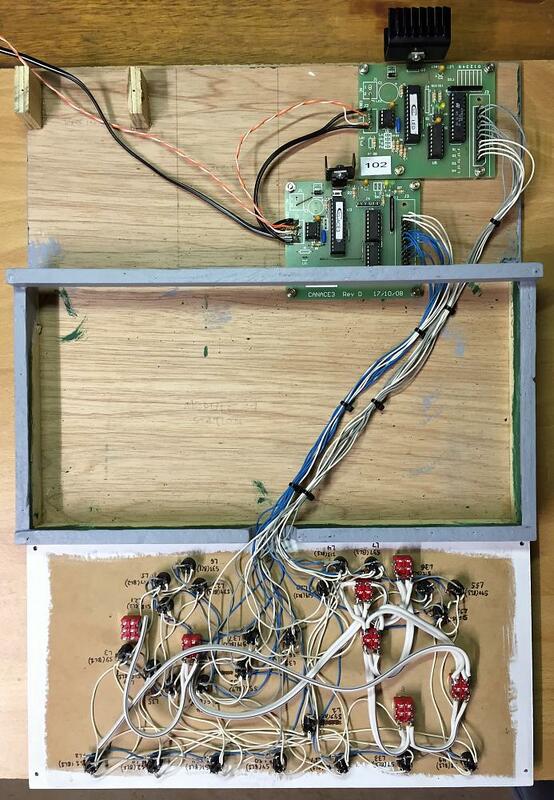 The wiring within the drawer for the switches and LEDs. Connected to the circuit boards are a black pair of wires to provide power, and an orange pair of wires for data communication between boards. The thick white cables on the toggle switches are for the throttle power to feed each track block.